Tarique Plummer wants to one day be prime minister of Jamaica. He has been working toward that goal since he was in Grade 6, with all his choices geared toward building his capacity, character and leadership skills. 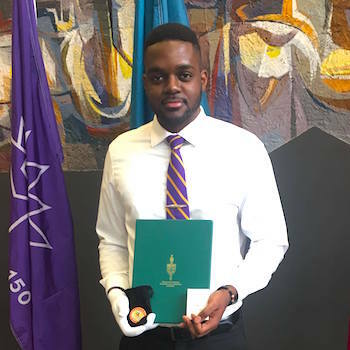 Though he came to Wilfrid Laurier University as an international student only a little more than three years ago, he has now been recognized at the national level for the contribution he has made to life in Canada. Plummer, a fourth-year student in Biochemistry/Biotechnology, recently received a Canada 150 Sesquicentennial Award of Recognition from Kitchener Centre MP Raj Saini, in the “engaging and inspiring youth” category. The awards, held at the Kitchener Public Library on Dec. 9, honoured 16 residents of Kitchener-Waterloo and five community groups. Plummer didn’t know about the award until two weeks before the ceremony, when he received a call from Saini. It turned out he had been nominated by a friend he worked with at Africa Camp, a youth summer camp run by Waterloo-based organization Life Change Adventures. Plummer was a volunteer leader two summers ago and camp director last summer. He says he feels honoured by the award but doesn’t do what he does for the plaudits. Chair of the board and chief governance officer for the Wilfrid Laurier University Students’ Union. Senior research and conference planning facilitator for the Lazaridis School of Business and Economics. Sports clubs coordinator for Laurier Athletics. Operations coordinator for Future of Africa, a non-governmental organization founded by a Laurier alumnus. An instructional assistant for Laurier’s Department of Chemistry and Biochemistry. A research associate with NaturalSci Regulatory Consulting Corp.
A writer for Medical News Bulletin. An undergraduate Laurier student senator. An elected student representative on Laurier’s Board of Governors. A market research interviewer for PMG Intelligence. An associate at the Fresh Food Company/Dining Hall. A volunteer with the Running and Reading after-school program at Cedarbrae Public School. A columnist for student newspaper The Cord. A journalist for Radio Laurier. Director of communications for Laurier club Eye to Eye. A global engagement student ambassador. Vice-president of Bricker House Council training and development. Club governance coordinator for Laurier’s Students’ Union. Vice-president of the Laurier Caribbean Students’ Association (now the Association of Black Students). Exchange participant manager for AIESEC, the world's largest non-profit youth-run organization. Vice-president of research and development for Laurier’s Faculty of Science Students’ Association. First-year executive representative on the Laurier Chemistry Association. A director of the Ontario Science Students’ Association. A member of Laurier’s Pre-Medical Society. How does Plummer find the time to do it all, as well as keeping up good marks in a demanding undergraduate program? Plummer will graduate in the spring and his plans for the immediate future are still up in the air. He may run for president of the Students’ Union. He may look for work. Or he may do a master’s degree in supply chain management at the Lazaridis School of Business and Economics – a departure from biochemistry but something he has discovered a love for. He is currently doing an independent study course with Professor and CN Fellow in Supply Chain Management Michael Haughton, concentrating on supply chain management in the health care sector. Haughton, who also supervises Plummer as a Lazaridis School research and conference planning facilitator, says Plummer is outstanding whether as a student, employee, volunteer or leader. Regardless of what he ends up doing when he graduates, Plummer hopes to stay in Canada awhile longer – perhaps long enough to complete a PhD. However, he has no intention of losing sight of his long-term goal in Jamaican politics. Despite the cold winters, a lengthy Canadian sojourn is part of the plan.